Enjoy the campfire experience with your fire contained in this rugged steel fire ring. These DNR-quality rings are made of 3/16"-thick rolled steel. The joints are continuously welded and exposed corners are chamfered for safety and durability. Powder coated. 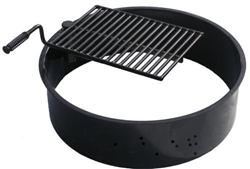 The ring&apos;s detachable, swing-away metal grate is perfect for back yard cookouts.